“The new field of biohybrid robotics involves the use of living tissue within robots, rather than just metal and plastic. Muscle is one potential key component of such robots, providing the driving force for movement and function. However, in efforts to integrate living muscle into these machines, there have been problems with the force these muscles can exert and the amount of time before they start to shrink and lose their function. Now, in a study reported in the journal Science Robotics, researchers at The University of Tokyo Institute of Industrial Science have overcome these problems by developing a new method that progresses from individual muscle precursor cells, to muscle-cell-filled sheets, and then to fully functioning skeletal muscle tissues. 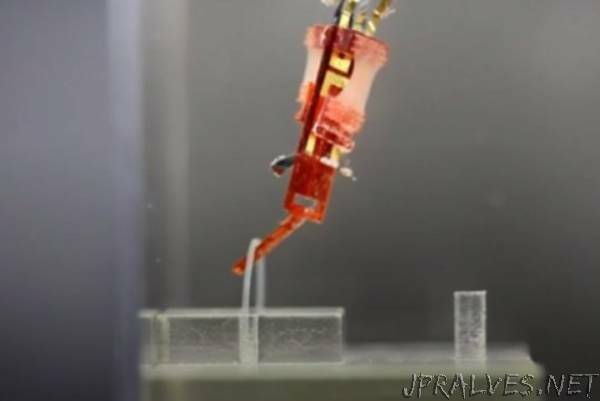 They incorporated these muscles into a biohybrid robot as antagonistic pairs mimicking those in the body to achieve remarkable robot movement and continued muscle function for over a week. The team first constructed a robot skeleton on which to install the pair of functioning muscles. This included a rotatable joint, anchors where the muscles could attach, and electrodes to provide the stimulus to induce muscle contraction. For the living muscle part of the robot, rather than extract and use a muscle that had fully formed in the body, the team built one from scratch. For this, they used hydrogel sheets containing muscle precursor cells called myoblasts, holes to attach these sheets to the robot skeleton anchors, and stripes to encourage the muscle fibers to form in an aligned manner. The team also tested the robots in different applications, including having one pick up and place a ring, and having two robots work in unison to pick up a square frame. The results showed that the robots could perform these tasks well, with activation of the muscles leading to flexing of a finger-like protuberance at the end of the robot by around 90°.